Let’s say you have a lot of oil and you want to sell it. To do that you have to get it from where you are to where the people are who will refine it so you can get your money. To move it you need a long tube-one that stretches from you to the market. The natural choice would be to connect sections of tube to each other and lay them end-to-end from here to there. The wrinkle comes when someone wants a lot of money for their right of way, or to a spot where something special happened and the land is sacred. In frustration, you might just decide to take an old pipe and make it bigger. You might buy property outright for your tube. Or, you might look around and see that you can use short pieces of tubing set on wheels and roll your oil from A to Z. Boom, that’s it! Brilliant! There is something wrong with this idea of oil in a moveable tube! 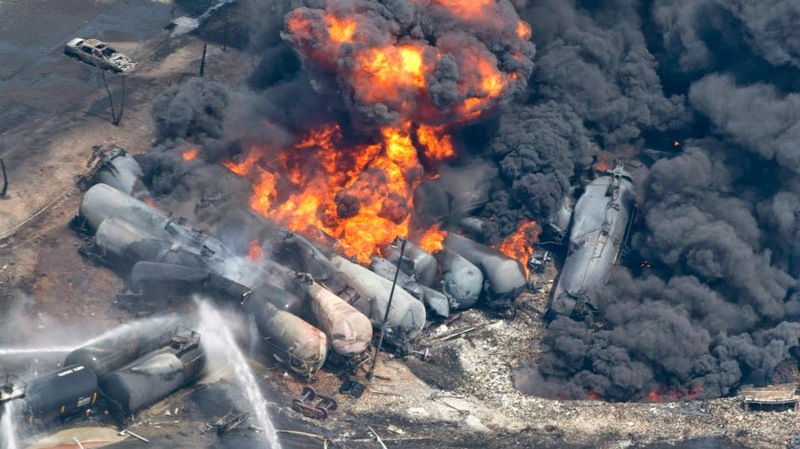 Perhaps you had never heard of Lac Megantic where an oil train exploded and killed 47people. There are lots of small towns all across this country and Canada that I haven’t heard of that are endangered by this pipeline on wheels. 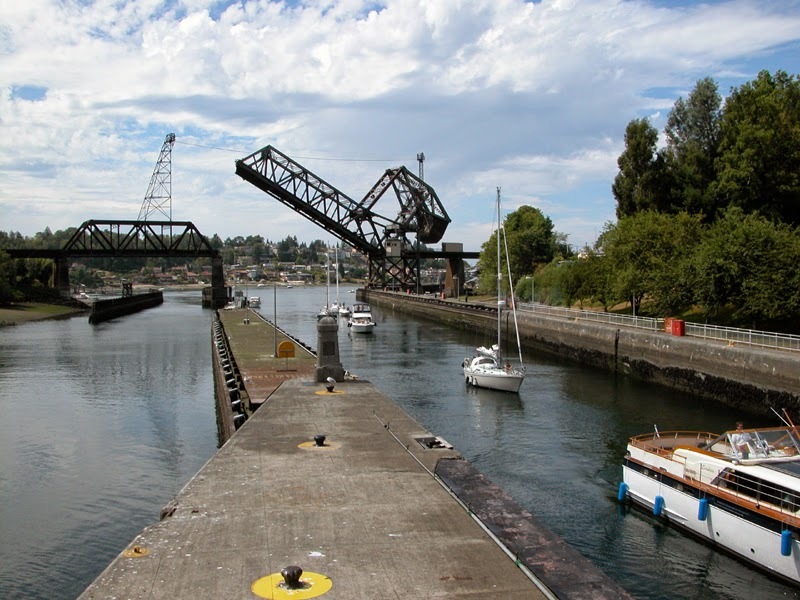 In Seattle, “The Great Northern Tunnel is a one mile double tracked railroad tunnel under downtown, completed by the Great Northern Railway in 1905, and now owned by the BNSF Railway.”[i] Not far from the northern portal of that tunnel is the Salmon Bay Bridge that was opened in 1914. It has a single track and carries all the rail traffic that moves up the coast to northern Washington and British Columbia. Those lines were built to carry passengers and freight but now carry all of the northbound coal and oil that comes from Montana, North Dakota and Alberta, BC. Don’t think for a moment that your town is exempt! On Valentines weekend three trains had derailments, one in Alberta, one in Ontario and one in West Virginia. More and more, we are learning that where there are tracks there is potential for oil transport disasters. When our great rail systems were built over 100 years ago they were intended to carry a much different cargo. Today the nation’s grain still moves by rail. Beside nearly every silo there is a train track. 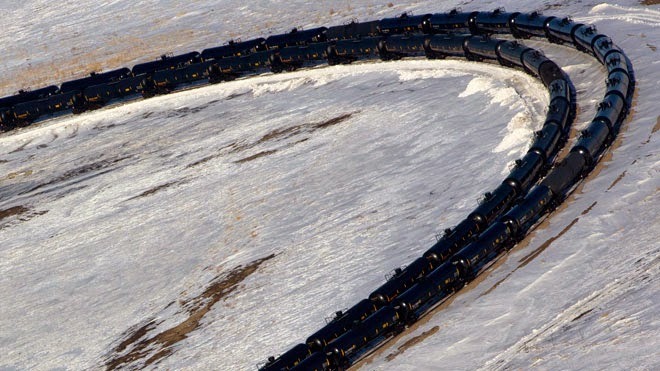 These long trains carrying crude are making insufferable delays for people and perishable foods. 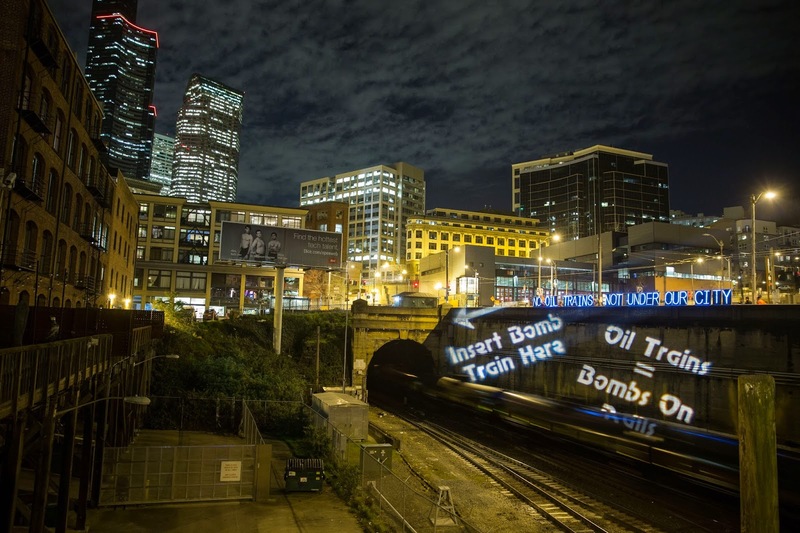 Rail lines split towns and cities in two, often leaving the need for emergency services and those who supply them on the opposite sides of slow, mile to mile-and-a-half long oil (and coal) trains. New documents, videos, and news stories pile up in email inboxes every single day. To enumerate all the wrongs that this “new” pipeline creates would be difficult, tedious and depressing work. Instead, let’s go back to the opening scripture. Am I my brother’s keeper? The Bible/God’s answer is in the affirmative. Furthermore, we know our kinship extends to every species on our planet. Noah was commanded to bring pairs of all things to the ark so they could continue to flourish. Our brothers and sisters walk, swim, fly, creep, and more. Together we make up the whole. And, yes, we are caretakers! PEC honors this caretaking of our brothers and sisters! Whether the oil is coming through a pipeline or by rail, its use is desecrating God’s good earth, clear skies and sacred water. We are advocating on many fronts for discontinuing the extraction and use of fossil fuels, for stronger rail safety standards, for no new export terminals, and for clean air and water. Not this (see below). We hope you will join us! We believe that we owe it to our supporters to continually spotlight a range of concerns. There are so many to choose from! During the last General Assembly cycle our focus was on fossil fuels. For the 2016 General Assembly in Portland, Oregon the emphasis will be on water. Let there be no mistake! Those of us who are charged with steering Presbyterians for Earth Care (PEC) do not think, for a moment, that any of the fossil fuel issues are resolved! In September 2014 at a conference in Alaska we chose our current topic. The rising seas and the shift in ice patterns are destroying coastal villages. The disappearance of the summer ice in the Arctic Ocean and the rush to drill, tour and colonize the area presents new challenges. The Pebble Mine looms over Bristol Bay and the last natural salmon run on the planet. There is a push to strip mine for coal in the Matanuska Valley, using water essential for the production of Alaska’s food. We haven’t had to look very far to find the link between the fossil fuel issues of the last GA cycle and the new focus on water. For example, strip mining takes huge amounts of water from pristine sources and returns it to the waterway poisoned, blackened and useless to fisheries, agriculture and the vital systems that make life sustainable for birds and beasts. Many attending the Alaska conference brought stories from all over the USA that had similar, anecdotal, accounts with a devastating water component. The next question is how do we, a volunteer group, research and publish issues we decide to highlight? Our plan is to take an issue a month. One person will present to the Advocacy committee the aspects of concern and support those with a theological base. The Advocacy group will reflect and refine the work in order to publish it and promote it as a potential overture, resolution or resource. It is our intention to add a paper to our Advocacy webpage each month. It is our desire to find topics that grow into overtures as they are studied and held up for examination by the Advocacy arm of PEC. To understand the importance of the new focus, watch Water: Sacred and Profaned. Further, we hope that we can capture the attention of people who want to bring an issue to the group for reflection and expansion. As much as we want polished works for publication, we also want to build a process that takes our supporters from having a concern to having a useful tool for Advocacy. If you would like to join this effort contact presbyearthcare@gmail.com.